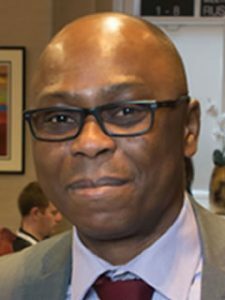 Dr Cyril Onwubiko is the Secretary – IEEE UK & Ireland, and Director, Cyber Security and Intelligence at Research Series Limited, where he is responsible for directing strategy, IA governance and cyber security. Prior to Research Series, he had worked in the Financial Services, Telecommunication, Health sector & Government and Public services Sectors. He is a leading scholar in Cyber Situation Awarenes (Cyber SA), Cyber Security, Security Information and Event Management (SIEM), Data Fusion, Intrusion Detection Systems and Computer Network Security; and vastly knowledgeable in Information Assurance, HMG Security Policy Framework (SPF) and Risk Assessment & Management. Cyril holds a PhD in Computer Network Security from Kingston University, London, UK; MSc in Internet Engineering, from University of East London, London, UK, and BSc, first class honours, in Computer Science & Mathematics. He has authored several books including “Security Framework for Attack Detection in Computer Networks” and “Concepts in Numerical Methods.” He co-edited the book on “Situational Awareness in Computer Network Defense: Principles, Methods & Applications” published by IGI Global, USA; and the editor of the Cyber Science 2016 and Cyber Science 2015 proceedings of the joint and co-located conferences comprising CyberSA, Social Media, Cyber Security & Cyber Incident. 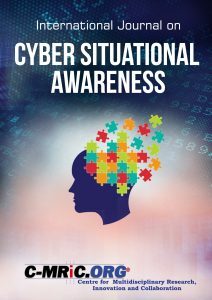 He is the Editor-in-Chief of the International Journal on Cyber Situational Awareness (IJCSA), ISSN (Online) 2057-2182. 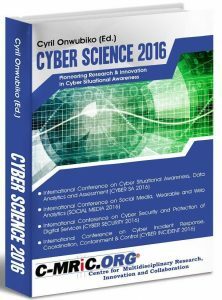 Cyril has authored several book chapters, including Security Issues to Cloud Computing, in the book on “Cloud Computing: Principles, Systems and Applications“ by Springer, “Challenges to Managing Privacy Impact Assessment of Personal Identifiable Data“, in the book on Information Assurance and Security Technologies for Risk Assessment and Threat Management: Advances and Designing Information Systems and Network Components for Situational Awareness, in the book on Situational Awareness in Computer Network Defense: Principles, Methods and Applications. He has published over 30 articles in leading and most prestigious academic journals and conferences. He is a passionate volunteer; hence he is a reviewer, keynote speakers, presenter, programme & steering committee member to over 30 academic conferences and journals. He is an invited guest lecturer to a number of universities in the UK, a PhD assessor and examiner to a number of universities, including Aalborg University, Denmark, and University of Derby, in the UK. He is also a Trustee of the Citizens Advice Bureau, Redbridge, Essex, UK. His research interests are in the areas of Cyber Security, Computer Network Security, Cyber-Threat Analysis, Graph Theory, Intelligence & Security Informatics, Intrusion Detection Systems, Risk Management, Data Fusion, Security Operations Centre and CERT management. Also, he is interested in the mathematical analysis of security and the application of mathematics in solving real-life problems. In 2009, Cyril, through a consortium comprising Dr Theo Dimitrakos (British Telecommunications, Project Contact), Dr Thomas Owens (Brunel University, Project Manager), and Dr Cyril Onwubiko (Research Series, Project Technical Lead), won a Technology Strategy Board (now Innovate UK) collaborative research and development project competition (Reference code: APPS2B) titled Information Infrastructure Protection: Managing Complexity, Risk & Resilience worth over 1 million pounds. 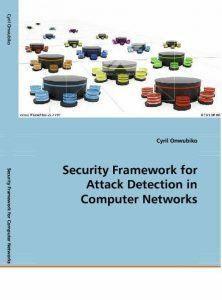 The research, which focused on holistic risk analysis framework for identifying interdependent nature and impact of cumulative risks within large complex infrastructures, is a prototype based on Cyril’s book Security Framework for Attack Detection in Computer Networks, VDM Verlag, ISBN: 3639089340. In the summer of 2014, Cyril founded the Centre for Multidisciplinary Research, Innovation and Collaboration (C-MRiC), a not for profit and nongovernmental organisation dedicated to the advancement of outstanding research and innovation through collaboration, and dissemination of scientific and industrial contributions through seminars and publications. Its products cover conferences on advanced and emerging aspects of societal issues, ranging from Cyber security to environmental pollution, and from Health IT to Wearable, with the best of breeds of such contributions featuring in notable journal publications. The centre participates, encourages and promotes collaborative scientific, industrial and academic inter-workings among individual researchers, scholars, practitioners, members of existing associations, academia, standardisation bodies, and including government departments and agencies (www.c-mric.org). Should you consider to invite me to present a keynote address to a seminar, conference, workshop, talk or/and become an industry-based supervisor to a student, please drop me an email. Dr Cyril Onwubiko is appointed Secretary IEEE UK and Ireland. Presented a Keynote speech on “Cyber Security Education for Employability” at the Bridging the gap of Business needs and Cyber Security Education event organised by the British Computing Society, hosted at the London Metropolitan University, Room GC1-08 on 18th Nov 2015. Invited as an Executive Member to the IEEE UK and Ireland Computer Society Chapter. 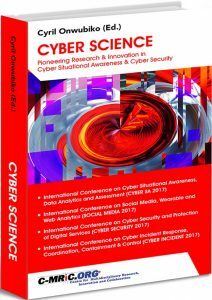 Edited the Cyber Science 2015 book comprising proceedings of the IEEE International Conference on Cyber Situational Awareness, Data Analytics and Assessment (CyberSA 2015), Social Media 2015, Cyber Security 2015 & Cyber Incident 2015. 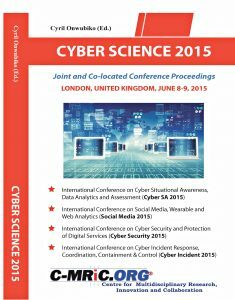 Author and presenter of the paper “Cyber Security Operations Centre: Security Monitoring for protecting Business and supporting Cyber Defense Strategy” at the Cyber Science 2015 joint and co-located conference, London, UK, June 8-9, 2015. Invited as a Programme Committee Member to the International Symposium on Foundations of Open Source Intelligence and Security Informatics (FOSINT-SI 2015), in conjunction with ASONAM 2015, Paris, France, August 26-27, 2015. Invited as a Reviewer to the Security Informatics, a SpringerOpen Journal, 2014. Invited as a Reviewer to the 5th International Conference on Society and Information Technologies, ICSIT 2014, March 4-7, 2014, Orlando, Florida, USA. Invited as a Programme Committee Member to the International ACM Conference on Management of Emergent Digital EcoSystems (MEDES’14), September 15-17, 2014 Buraidah Al Qassim, Saudi Arabia. Invited as a Reviewer to the 5th International Multi-Conference on Complexity, Informatics and Cybernetics IMCIC 2014, jointly with the 20th International Conference on Information Systems Analysis and Synthesis: ISAS 2014 – March 4-7, 2014, Orlando, Florida, USA. Invited as a Programme Committee Member to the Theory and Practice to Modern Computing (TPMC 2014), IADIS Multi Conference on Computer Science and Information Systems, Lisbon, Portugal, 15-17 July 2014. Invited as a Programme Committee Member to the International Symposium on Foundations of Open Source Intelligence and Security Informatics (FOSINT-SI 2014), in conjunction with ASONAM 2014, Beijing, China, August 18-19, 2014. Invited as a Programme Committee Member to the Sixth International Conference on Future Computational Technologies and Applications – FUTURE COMPUTING 2014, May 25-29, 2014, Venice, Italy. Reviewing a selected number of articles for the 7th International Multi-Conference on Engineering and Technological Innovation IMETI 2014, Orlando, Florida, USA, July 15-18, 2014. Invited as a Programme Committee Member to the 3rd International Conference on Sensor Networks, SENSORNETS 2014, Lisbon, Portugal, 7-9 January, 2014. Invited as a Reviewer to the China Communications Journal, ISSN: 1673-5447, 2013. Invited as a PhD Examination & Assessment Committee member for Dr Ezer Osei Yeboah-Boateng, in Information Security – Aalborg University, Denmark, 2013. Invited as a Reviewer to the International Journal of Criminology and Sociology, Security, Forensics and Crime Track Reviewer, Life Sciences Global, 2013. Invited as a Programme Committee Member to the IEEE AFRICON Conference (AFRICON 2013), Mauritius, 9-12 September 2013. Elected Senior Member IEEE – The World’s largest technical professional society. Reviewing a selected number of articles for the 6th International Multi-Conference on Engineering and Technological Innovation IMETI 2013, Orlando, Florida, USA, July 9-12, 2013. Invited as a Programme Committee Member to the Theory and Practice to Modern Computing (TPMC 2013), IADIS Multi Conference on Computer Science and Information Systems, Prague, Czech Republic, 22 – 24 July 2013. Invited as a Programme Committee Member to the IEEE Eurocon 2013, EUROCON2013 in Zagreb, Croatia, 1 July – 4 July 2013. Invited as a Programme Committee Member to the IEEE International Conference on Intelligence and Security Informatics, IEEE ISI 2013, Seattle, Washington DC, USA, June 4-7, 2013. Invited as a Programme Committee Member to the 2nd International Conference on Sensor Networks, SENSORNETS 2013, Barcelona, Spain, Feb. 19-21, 2013. Reviewing a selected number of articles for the 5th International Multi-Conference on Engineering and Technological Innovation IMETI 2012, Orlando, Florida, USA, July 17-20, 2012. Invited as a Programme Committee Member to the IEEE International Conference on Intelligence and Security Informatics, IEEE ISI 2012, Washington DC, USA, June 11-14, 2012. Invited as a Programme Committee Member to the Theory and Practice to Modern Computing (TPMC 2012), IADIS Multi Conference on Computer Science and Information Systems, Lisbon, Portugal, July 17-23rd, 2012. Reviewer to the 16th World Multi-Conference on Systemics, Cybernetics and Informatics, WMSCI 2012, Orlando, Florida, USA, July 17-20th, 2012. Invited as a Reviewer to the special track on Science 2 and Expansion of Science S2ES 2012 in the context of the 16th World-Multi-Conference on Systemics, Cybernetics and Informatics: WMSCI 2012, Orlando, Florida, USA, July 17-20, 2012. Invited as a Reviewer to the 3rd International Conference on Engineering and Meta-Engineering ICEME 2012, Orlando, Florida, USA, March 25-28, 2012. Invited as a Reviewer to the 5th International Multi-Conference on Engineering and Technological Innovation IMETI 2012, Orlando, Florida, USA, July 17-20, 2012. 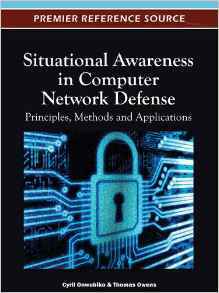 Co-editor of the book – Situational Awareness in Computer Network Defence: Principles, Methods and Applications, IGI-Global, USA (in press) September, 2011. Invited as a Programme Committee Member, The 1st International Workshop on Security and Privacy Preserving in e-Societies, SeceS 2011, Baabda, Lebanon, June 9-10, 2011. Invited as a Reviewer to the 4th International Multi-Conference on Engineering and Technological Innovation IMETI 2011, Orlando, Florida, USA, July 19-22, 2011. Invited as a Programme Committee Member to the IADIS Multi Conference on Computer Science and Information Systems – INFORMATICS 2011, Rome, Italy, July 20-26, 2011. Invited as a Programme Committee Member to the 2nd International Symposium on Security and Information & Communications Technologies: SICT 2011, Florida, USA, July 19-22, 2011. Invited as a Programme Committee Member to the IEEE International Conference on Intelligence and Security Informatics, IEEE ISI 2011, Beijing, Chaina, July 10-12, 2011. Reviewer to the International Symposium on Science 2 and Expansion of Science (S2ES 2011), Orlando, Florida, USA, July 19-22nd, 2011. Reviewer to the 15th World Multi-Conference on Systemics, Cybernetics and Informatics, WMSCI 2011, Orlando, Florida, USA, July 19-22nd, 2011. Invited as a Track Chair 4-6: Network Forensics, Network Security & Investigation Tools at the BIT’s Annual World Congress of Forensics (WCF-2010), Dalian, China, October 21-23, 2010. Reviewer to the International Symposium on Security and Information/Communication Technologies, Systems and Applications SICT 2010, Orlando, Florida, USA. Reviewer to the 3rd International Multi-Conference on Engineering and Technological Innovation IMETI 2010, Orlando, Florida, USA. Reviewer to the 14th World Multi-Conference on Systemics, Cybernetics and Informatics, WMSCI 2010, Orlando, Florida, USA, June 29th – July 2nd, 2010. Reviewer to the IEEE International Conference on Intelligence and Security Informatics, IEEE ISI 2010, The Fairmont Waterfront Hotel, Vancouver, B.C., Canada, May 23-26, 2010. Invited as a Programme Committee Member to the IEEE International Conference on Intelligence and Security Informatics, IEEE ISI 2010, The Fairmont Waterfront Hotel, Vancouver, B.C., Canada, May 23-26, 2010. 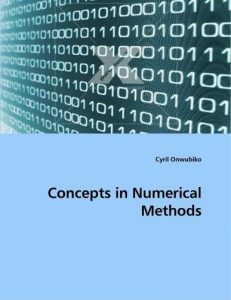 Published a second book, titled ‘Concepts in Numerical Methods’, ISBN 978-3-639-18609-3, September 2009. Invited as a Technical Programme Committee Member to the European Conference on Computer Network Defense ( EC2ND’09) in cooperation with ENISA , Milan, Italy. Invited Guest Lecturer: I’ll be giving a talk on “Multisource Data Fusion in Network Attack Analysis” to the MSc in IT Security Students at the London Metropolitan University , Tower Hill Building, 15th April 2009. Submitted a paper at the IEEE International Conference on Intelligence and Security Informatics ( IEEE ISI’09 ), June 8-11, Dallas Texas, USA. Submitted a paper at the European Conference on Computer Network Defense ( EC2ND’08) in cooperation with ENISA , December 11-12, 2008, Dublin City University, Dublin, Ireland. Invited as a Programme Committee Member to the IEEE International Conference on Intelligence and Security Informatics, IEEE ISI 2009 . Invited as a Technical Programme Committee Member to the 4th International Conference on Advances in Information and Communications Engineering (AICE), London, UK, 10th July 2008. Attended the 3rd Conference on Advances in Computer Security and Forensics ( ACSF 2008 ), Liverpool, UK, where I presented a paper titled – “Data Fusion in Security Evidence Analysis.”, 10-11th July 2008. Attended the 4th International Conference on Global E-Security 2008 (ICGES 2008), London, UK, where I presented a paper titled – “Multisensor Message Exchange Mechanism.”, 23-25th June 2008. Attended the 4th International Conference on Computer Science & Information Systems, (ICCSIS 2008) , Athens, Greece, where I presented a paper titled – “Multisensor Data Fusion: An Emerging Approach in Security Monitoring.”, 19-21st June 2008. Invited as a Technical Programme Committee Member to the European Conference on Computer Network Defense (EC2ND’08) in cooperation with ENISA, December 11-12, 2008, Dublin City University, Dublin, Ireland. Invited Guest Lecturer: “Auditing for Security Management”, delivered at the London Metropolitan University, Tower Hill Building, for MSc in IT Security Students. ( PPT), 7th April 2008.